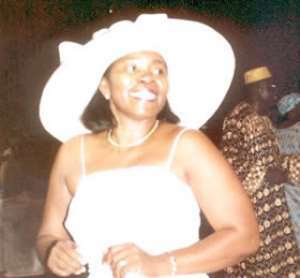 The Director General of the Ghana Broadcasting Corporation, Eva Lokko is on her way out. Indeed, going by the ruling of the appointing body, she should have been out by September 2003, according to unconfirmed information reaching the Statesman. Sources close to the NMC told the Statesman that a sub-committee set up by the Commission to look into the GBC crisis concluded that the performance of the former UNDP employee since her appointment on Monday September 2, 2002 has shown that the GBC job was far beyond her. Curiously, the NMC on Thursday April 15 decided that her appointment should not be confirmed at the end of the one-year probationary period. Her appointment letter dated August 26, 2002 (NMC/SOM/B/133), stated: The Director-General is the Chief executive of the corporation and is responsible to the commission through the Board of Directors. The Commission however hopes that you will be able to turn the place around and create a positive image. It continued: “The appointment which is for four years could be renewed subject to the satisfactory performance and you will be on probation for one (1) year. Even though she has effectively outstayed the probation period, the appointment letter further stated: “If at any point of time your performance is seen to be unsatisfactory, the Commission reserves the right to terminate the appointment unconditionally, or by giving you three (3) moths notice or payment of three (3) salary in lieu of notice. The Statesman yet to be verified is that her deputy has decided to pre-empt the NMC by resigning. The committee was also charged to investigate the problems and circumstances leading to the workers' demonstration of March 26, 2004 and determine the current state of affairs at GBC and make appropriate recommendations for the consideration of the Commissions. The committee submitted its report on Thursday, April 15 and was subsequently endorsed by the Commission. The committee made damning findings against the chief executive. “It was also evident that the high directive command and control management style of the director-general with ample evidence of favouritism and snobbishness precluded teamwork and delegation, the report added. The GBC board led by Prof. Stepehn Adei of GIMPA had earlier noted in a report submitted to the NMC that Eva Lokko had displayed immaturity and inexperience in the handling of GBC matters. Ms. Lokko indeed applied for the deputy director general position before she was catapulted to the topmost job following a vacancy created by the sudden dismissal of her predecessor, Seth Ago Adjetey.